Please note that the first day, 28 of May, is only open for invited speakers, jurors, and the staff and students of the Department of Game Design. 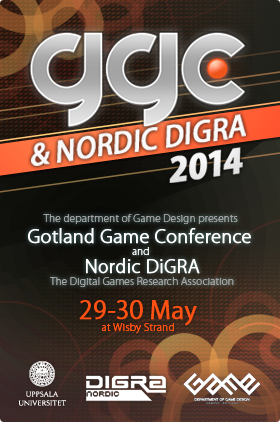 Ergo; the public Gotland Game Conference is 29-30/5. In the near future, people will live in multiple realities, leading parallel lives in which they assume many fictional identities. For Season 4 of Game of Thrones, Transmedia Storyteller brought the world of Westeros to Spain – allowing fans to immerse themselves in a massive multiplayer roleplaying game, encompassing video, social media, email, live events, physical locations as well as online and mobile. This talk will look to our workflow and design process, how we use stories and technology to engage audience and a brief glimpse to the future of gaming as we see it. The idea that games have something to offer educational practices is a foundation for both new research fields as well as emerging industries. Since both games and educational practices are diverse phenomena the discussion about their connection is a multifaceted affair that comes in different shapes. For example, games are said to have qualities that increase student motivation, provide a more authentic learning experience, teach systems thinking, facilitate collaborative problem-based learning, and contain system mechanics that can be harnessed by other sectors (i.e. gamification). In other word it is basically a complete mess. In this talk, Jonas summarizes 15 years of experiences from being a part this mess. He condenses the discussion down to 10 commandments that any stakeholder in the debate should be aware of. As the Games Industry continues to grow in breadth, depth, and definition, Game Designers face an even greater challenge to grow creatively with it. Never has the trope, “The only limit is yourself”, been so true and daunting. Jerry Belich of Monkey Theater will explore the challenges of being creative in an industry that all but demands it.